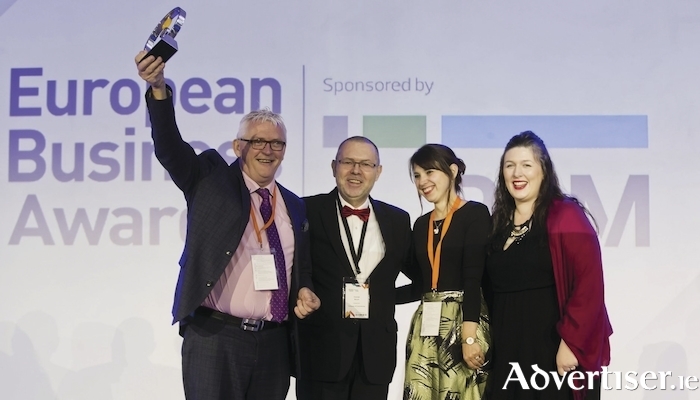 Neylons Facility Management from Loughrea, County Galway, Ireland has been named Winner of the Workplace and People Development Award in the Grand Final of this year’s European Business Awards sponsored by RSM, at an awards ceremony held in Warsaw. Over 450 successful business leaders from across Europe came together at the two day event with politicians, ambassadors and academics to celebrate the remarkable business achievement of Neylons Facility Management in Europe’s biggest and most prestigious business competition. Neylons Facility Management was watched by its team back home in Ireland via a live link as they were named one of 13 winners at the Gala Awards Dinner. The feeling of achievement has rippled across the entire company as this award is all about Neylons ethos of putting people at the heart of what they do. The judges were impressed with their ability to promote from within and create the workforce of tomorrow. This is rolled out through Neylons Academy for Growth. One of those promoted from within was CEO Maria Sava who joined Neylons over 10 years ago as a general operative. She is seen as an inspiration to her team and her team are an inspiration to her! For a homegrown company, from the West of Ireland, to take home the prize for Best People Development in Europe it is a major achievement. Founder Sylvester Neylon will start a tour of site around the country next week to share the glory of the award with the employees. “We are a service company and people are at the heart of what we do. That is why this award means so much to us. From day one I wished to create a great place to work. Today we have culture of ownership and high achievers. Everyone has opportunity and The Neylons Academy for Growth is one of the big drivers of this,” he said. The competition began last year with over 112,000 business from 34 countries initially considered. 2898 businesses were then named ‘Ones to Watch’ in December, and after a further review from a panel of independent judges, 289 companies were announced as ‘National Winners’ and finalists in the competition. Neylons Facility Management was founded in 2004 by Sylvester Neylon in Loughrea Co. Galway. Sylvie has gone on to build strong and lasting relationships with all his clients and now Neylons have a team of more than 500 employees nationally providing a high quality integrated facility management. Together they have grown Neylons into an innovative leader in Facility Management for Healthcare Sector, Nursing homes Assisted living and office and retail. Over the last five years they have grown their market share in Pharmaceutical and Construction Sectors including data centres. Services include caring, catering, cleaning, security and electrical & mechanical facility management services. Adrian Tripp, CEO of the European Business Awards said that their winners are the gold standard for business excellence. Neylons Marketing Manager Ciara Shields who attended the event in Warsaw last week said it is not often you find such a hidden gem like Neylons. “This is a story that can inspire so many service companies in how create an environment for people to reach their potential as a team. There are so many more fantastic stories to be told about this company from the West of Ireland. For now, though we will take a moment to applaud the people that made this organisation great,” she said. RSM firms provide audit, tax and consulting services to clients across the globe. Within Europe, RSM firms have experts in 43 countries who work as an integrated team, sharing skills, insight and resources, as well as a client-centric approach that is based on a deep understanding of clients’ businesses.